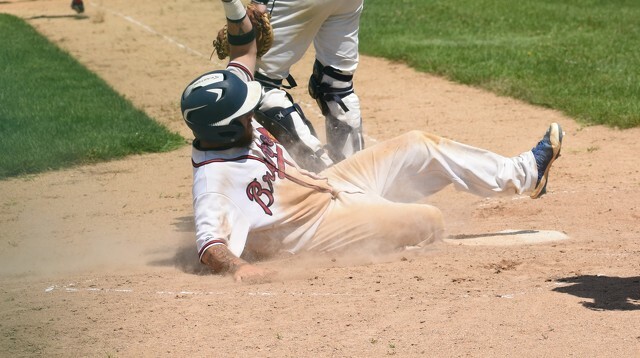 Spring Mills’ Brandon Martz slides into home during a recent Braves’ win in the Centre County League Baseball playoffs. From the miserable weather, to the defending champion Clarence Mounties’ first playoff loss in two years, to a last-inning, game-saving rally by the Howard Hawks, the 2018 County Baseball League playoffs so far have been anything but run-of-the-mill. And, as both semifinal series stand at 2-1 with a do-or-die fourth game on tap, there will, no doubt, be more where that came from. Clarence and Howard both stepped up with pivotal wins in Game 3 of their respective series, but under vastly different circumstances. The Mounties were tied 1-1 and took a 5-0 victory over Spring Mills on July 31 to move within a win of the championships. The teams split the first two games, with Clarence winning the opener July 26 and then Spring Mills exploding for a six-inning, 15-5 blowout July 29 at Shaner Fields. The Braves’ win marked the first time Clarence lost a playoff game since 2015. Howard, on the other hand, was staring at elimination at the hands of the young and revamped Blanchard Bees. The Bees took the first two games, 3-2 on July 26 and 8-3 on July 29, and were looking for a sweep in Game 3 on July 31 in Howard. They almost had it. Blanchard went into the final inning with a 4-3 lead over Howard and seemingly ageless pitcher Brian Pelka, but the Hawks somehow found life with just two outs remaining in their season. Blanchard scored a run in the third inning and two in the fourth to take a 4-3 lead that held up into the final inning. After a ground out, the Bees were two outs away from the series’ win. But, then, Scott Zuback singled and Tyler Wormer tied the game with an RBI double into the left-field gap. Dan Cole followed with another RBI double that put the Hawks ahead, 5-4, and Cole eventually scored the sixth run after a two-out wild pitch. The rally gave the ball back to Pelka in the bottom of the seventh, and he came through to complete the comeback win. “It was a great, classic comeback never-say-die win,” Pelka said. “We were hitting the ball the whole game but just not finding the holes. “And they hit me pretty good, but when they put guys on base I had to hunker down and get out of some jams. “It was close to the season being over for us, and they (the Bees) are a heck of a young team. They are all like 25 years and under. The kid who pitched against us was 18, and I’m 46. In Clarence, the Mounties returned home for Game 3 against the Braves after absorbing a 10-run loss July 29. Spring Mills’ hitters, highlighted by Colton Treaster’s grand slam, were relentless all day against the Clarence pitchers and tied the series at one game apiece. What the Mounties needed in Game 3, according to Gavlock, was someone to slow down the Braves’ hitters, and they found him in pitcher Hunter Price. Price came through with a gem at exactly the right time. He threw a four-hit shutout, struck out six and walked just one in the Mounties’ 5-0 win. Not only that, but he also drove in three of the runs at the plate in an all-around performance that moved Clarence another step closer to its third finals’ appearance in a row. Both series now will move to Game 4 which will present opportunities for Clarence and Blanchard to clinch and advance to the playoff finals. But Howard and Spring Mills will also each have a chance to tie and force a deciding Game 5. As for Howard, it will be the team’s second elimination game in a row. The Hawks weathered one, but Blanchard will be again looking to get into the finals in the team’s first year back into the league. Weather permitting, both semifinal series could be completed by tonight and the finals would then begin Sunday, Aug. 5.